Yes, I know that’s bad grammar, but we seem to be stuck with it culturally. Don’t you ever wonder who the person is who recorded that little sound bite for AOL, and why they couldn’t say you have mail? But I digress. Sometimes (usually) I’ve got mail, and sometimes I don’t. Last Friday my mail was moved from one server to another. Although I’ve been promised that no mail would ever, ever, ever be lost… well… I don’t have a lot of confidence since the last time such a move occurred mail was lost. So, if you sent me any email last Friday or after and have not heard back from me, please resend. I would hate to think that anyone would feel ignored. I also pulled the plug on something that I think was causing the blog to load slowly. Hopefully it will be peppier now. When I was young, I could tell that spring was coming when the weather turned decidedly warmer (almost up to freezing). The sky was deep blue, instead of winter white. The snow began to melt. And I swear I could smell the green things in the ground starting to stir. The tease lasted for a week or two, and then suddenly it was spring. Crocus bloomed, and then daffodils. The air was crisp, the breeze warm, and birdsong was everywhere. Rain, if it came, was a gentle shower that soon ended and left the most delicious smell in the world (only sheets dried outside on the line come close). OK. It was a desert. But this is the spring that my whole being still expects, and never mind that I have lived in a rain forest for the past 35 years. And although I tell myself every year that I’m not going to get the spring of my youth, I am still vaguely disappointed when it comes gray and soggy, and the daffodils struggle up through the muddy clay. I feel somehow… cheated. Yet geese have returned (I almost hit one that was standing in the middle of the street the other day), birds are singing, flowers are blooming, and so it must be spring. In the last several days we have had rain, snow, rain, hail, 5 short minutes of sun, rain, snow, hail, etc. According to the northwest forecast that I trust the most, more of the same is promised for the next few days. There have been years when we had snow in April, but those years are very, very rare. We usually don’t even have snow in January, thus my displeasure. Because the calendar tells me it is spring, I will try hard to agree with it. In keeping with spring, have you seen a yummier, springier yarn? This is Andes Mint from Sharon of Stitchjones. Sharon kindly brought some to the Wednesday night sip-n-stitch. Even though I was a bit late, she had guarded a skein from the ravening hordes, and thus I was able to bring it home with me. During our 5 minutes of sun yesterday, I quickly took a picture. Is this not just the most wonderful color? I’m not sure yet what it will be, but it will be something soon. 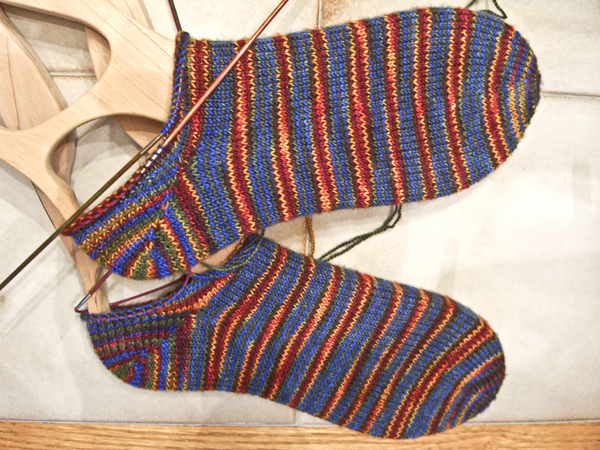 As soon as I finish the clown barf stripy socks. I am distracting you from my lack of progress by showing you yarn pr0n. But I do continue to work on them. And I’m hoping that I will get some good solid knitting time in this weekend. 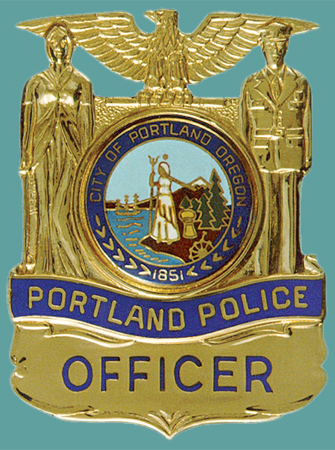 Finally, please consider turning out your lights for 1 hour at 8:00 PM tonight. We can all knit in the dark for just a little while! Something happened when I wasn’t looking. I must have been distracted. I was looking down and not up. And I missed it. 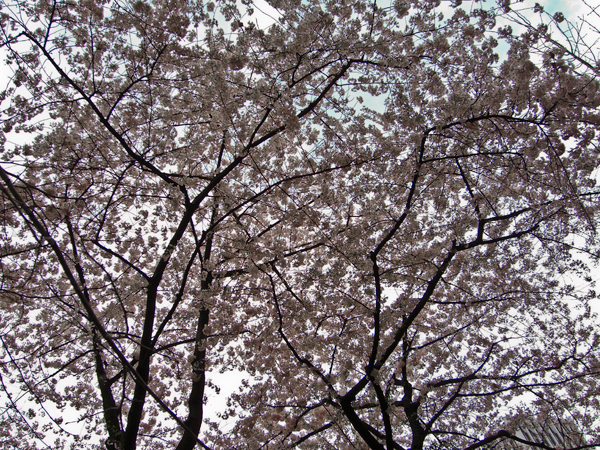 The cherry blossoms are insisting that it’s spring. Then why, pray tell, was it bad-assed cold a mere 32 degrees Fahrenheit when I woke up this morning? That’s a January sort of temperature. There might be, the weatherman tells me, snow down to 500′ tomorrow. That’s my house. Look at the poor trees in the picture. Look cold, don’t they? I swear to you that those blossoms are pink. It’s impossible to tell in this photo because the angry white sky and the chill have bleached the color right out.. Here. I’ll show you some petals that had fallen off and drifted against the curb on the sidewalk along with some of last year’s seeds. See? They are pink. Not 20 minutes after I took these pictures, as I sat in a local coffee shop drinking a cuppa Earl Gray, the heavens opened up and the rain poured down in sheets. 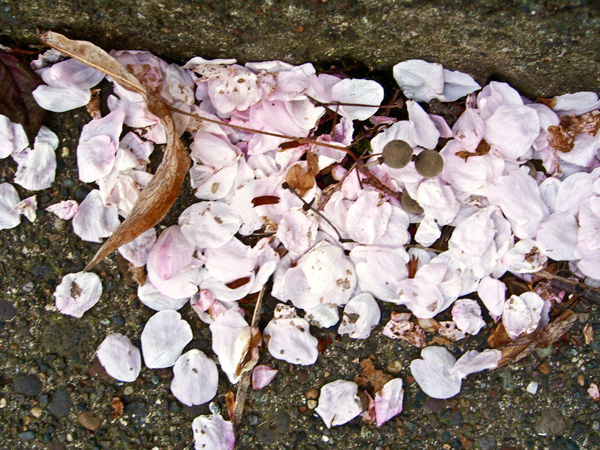 I’m glad I stopped to take a couple of snaps because I’m betting that most of the petals are on the ground now — and not in lovely, albeit chilly, pink drifts but in soggy, sodden, brownish masses. Of course, all of this is to distract you, gentle reader, from the fact that there’s no knitting content. I have been knitting. Or at least I’ve been meaning to knit. 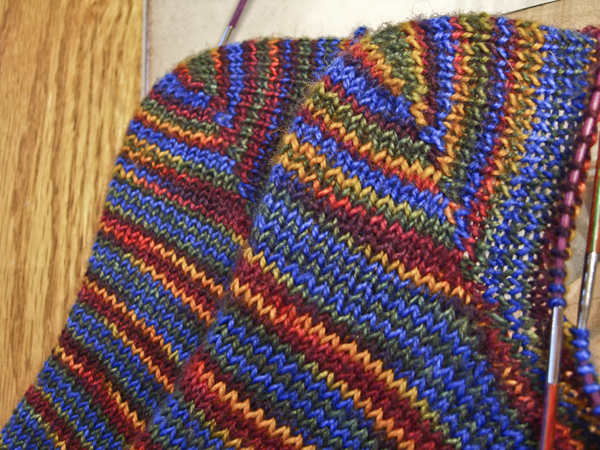 I’ve made it about 2″ up the ankles of the clown barf stripy socks. Most of the progress has been made here and there while waiting in a line and such. At night, instead of knitting, I’ve been catching up on my long-neglected blog reading. It’s been wonderful to visit old friends that I haven’t seen for way too long. And tonight I read two bloggers who mentioned doing laundry. And that totally reminded me that I really needed to throw a load in right away. Because otherwise tomorrow I would have to go naked to work. And, it being a rather conservative establishment, that would probably be frowned on. Not to mention cold — especially if it does snow. Of course, if the snow sticks I could justify working from home tomorrow. But unless it melted pretty darn quick I would miss Wednesday knitting. And I really don’t want to do that since I have promised a little semi-impromptu lesson in Judy’s Magic Cast-on — I swear I’ve been asked, although lack thereof never stops me, and it’s so fun to watch coffee house denizens trying to figure out why a whole group of people are intently watching me wind yarn around needles. And worst of all, I would miss Sharon of Stitchjones fame and the yummy new colorway in her sock yarn that she is bringing called Andes Mint. Go over to her blog or her Etsy shop and check it out. But if you think you’re going to buy it all up, you’ll have to go through me first! Won’t You Wear A Sweater? Today it’s Won’t You Wear A Sweater day as part of Pittsburgh’s Won’t You Be My Neighbor 250th birthday celebration. Today would have been Fred Rodgers’ 80th birthday. For those of you who may not know of Mr. Rogers, he was a gentle soul who hosted the children’s TV show Mr. Rogers’ Neighborhood that was filmed in Pittsburgh. Off screen he was a tireless advocate for children. He also testified during the Betamax hearings that let do the Supreme Court ruling that VCRs did not violate copyright. Mr. Roger’s Neighborhood began airing in 1968 and ceased production at the end of 2001. At the beginning of every single episode, Mr. Rogers would take off his jacket and put on a sweater. He had a whole closet full of zippered cardigans knit by his mother. So won’t you wear a sweater? It would indeed be ironic if, in the name of national defence, we would sanction the subversion of one of those liberties which make the defence of our nation worthwhile.